Why did you study Conservation Biology? I first came to UQ in 2011 with the University of California’s study abroad program, and absolutely loved it there. After I finished university in California I heard about the Masters of Conservation Biology program, and I knew it was the perfect fit for me. I wasn’t sure what route I wanted to go with my career, just that I wanted it to be in conservation. I manage a captive breeding colony of Amargosa voles, an endangered species native to California. My work is part of the Amargosa Vole Conservation Project, which involves teams at the local, state, and federal levels. The captive animal population serves as an insurance colony and as a source of animals for reintroduction. 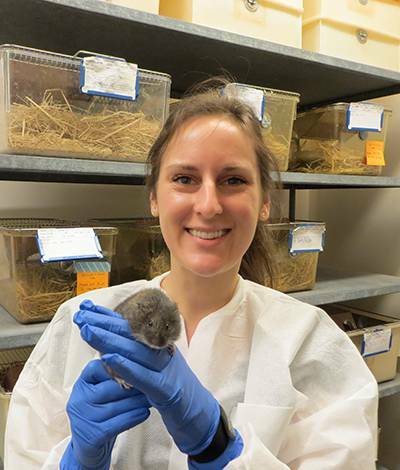 I manage colony husbandry, train and oversee volunteers, and am involved in multiple research projects investigating the biology and management of the species. The program’s mix of fieldwork, policy, industry and community engagement helped me decide which path to pursue, and gave me insight into all of the aspects I deal with in my current job. The breadth of study and intensive class schedule can be intimidating, but you will learn so many practical skills during your time in the program and come away with lasting connections with other conservation biologists. What I enjoy most is getting a mix of hands-on animal work, management experience, and biological research. I get to see the different parts that contribute to an overall conservation effort, and how my actions contribute to its success.